Part of the show How do I Look? Guglielmo - Currently there are more than 7 thousand tons of stuff up there in space and mostly are old satellites or the final stage of rockets. Things that have been put in orbit maybe decades ago and they are still there spinning around. Some of them have broken into bits. It is a problem because this stuff in orbit travels really fast and so even as more fragment hitting another satellite could destroy this new satellite. Guglielmo - Well, what we have done with our partner is to put together a consortium to demonstrate the technologies that can be used to remove some of this debris and the project has been sponsored by the European Commission. The kind of technologies that we are going to demonstrate are relatively simple technologies if you want. One is a net. The idea is to capture your piece of debris with the net and this net envelopes the object and then you can drag it down. Another technology that we are going to demonstrate in a few months is a harpoon. Also here is a similar thing so with the harpoon you try to capture your object and then you will pull it down until it burns into the atmosphere. Izzie - Okay. So you’ve just done this first test so talk me through it. How did it work? Guglielmo - Okay. Everything went very well. From the main satellite, which is the size of an old television set we have released our artificial target. It’s maybe the size of a loaf of bread to give people an idea. Then this has inflated a structure to be much bigger so it is more representative of a real piece of debris. Then from the main satellite we have launched the net that has captured our little debris with this inflatable structure and has completely enveloped our debris. And so now is going to the orbit with it and burn into the atmosphere. Izzie - How is all of this controlled? How would your device know where to capture this piece of debris? Guglielmo - Ah, well. In our case we have released our own piece of artificial debris so we knew where it was, and therefore was relatively easy to recapture it. In a real scenario the first thing that the satellite will have to do is to get closer to the potential target, so you would have to have a more sophisticated control of the satellite in order to get closer to your target; therefore you can capture it. Izzie - Another test that the RemoveDEBRIS team has scheduled is to use a camera to monitor the speed and shape of debris in order to track how a potential target moves. After that it’s over to trying a harpoon rather than a net to capture this junk. But how does it all then get destroyed? Guglielmo - The idea is that we are going to lower the orbit so this junk can burn into the upper atmosphere. And normally our satellites are designed in a way that they can burn completely in the higher atmosphere. However, you will try to do these maneuvers maybe over the ocean so even in the unlucky case that a little part of your satellite maybe doesn’t burn completely, the potential fragment then drops into the ocean rather than in an area where maybe there is a higher density of habitants. Izzie - Rather than trying to scoop up every bit of space junk this debris harvesting device will aim to collect the biggest pieces of junk in space to save them from breaking up into smaller fragments and adding to the overall pile of debris in orbit. Once it has been scooped up the net or harpoon, the RemoveDEBRIS satellite will use a giant sail to steer towards our atmosphere until the satellite, and the junk in tow, is all burnt up. So what's next for the team? Guglielmo - Now that we have shown that the technology is viable we hope to be able to convince all the stakeholders to actually finance such a mission. What we imagine is just to do a few missions every year where people would agree beforehand what is the particular piece of debris that we are targeting so you can go up and capture this piece of debris and then deorbit it.This is the kind of scenario we have in mind. So if as proposed a harpoon is used on a large, inert object in space, it stands at worst to shatter the entire object, leading to a debris field of small, untraceable bits that are now in different orbits from the original mass. Or at best the lance penetrates the mass with hopefully only a few flecks and particles being released on impact. But are these small potential debris pieces being flung about not a problem also? The same applies to a net, which could break off small portions of an irregular structure during capture, leading again to a debris field of small particle. For example, the net could snap an antenna or a solar panel off a cubesat that is being secured. On a separate point, there is the technical challenge that the Surrey platform has to lock orbit with the debris it wants to capture. 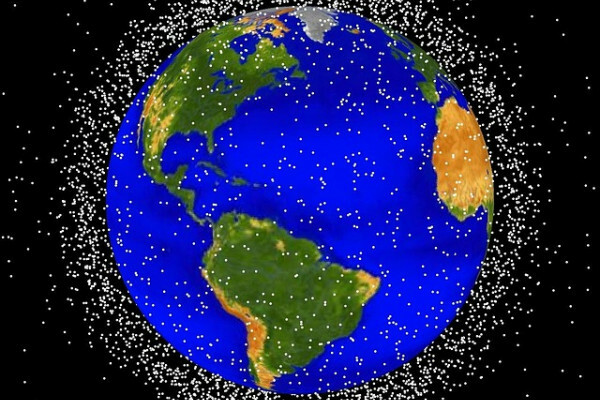 While the debris that is easiest to reach is in low orbit , what is the point of capture as it will eventually reenter the atmosphere as the orbit decays? Going after pieces in higher orbit would be more useful but will take more delta V to reach and then takes even more delta V to reduce the debris' altitude for it to eventually de-orbit. That means more fuel and thus more cost. Even if that were to be funded, the Surrey platform will then need to make significant orbital maneuvers that will require yet more fuel so as to go after another debris object in yet another orbit. And let's not forget that the Surrey module also needs to be de-orbited as well once its mission is complete, so that it doesn't add to the already large collection of space junk. Again, the higher it 's altitude, the more fuel it will need to de-orbit, again at more cost. So how is this viable? Did I misunderstand? BTW Naked Scientist, have you considered a follow-on piece after looking into the UN work in this areas being done by the Committe on the Peaceful Use of Outer Space (COPUOS)? That could be interesting.